On a NOOK Tablet, there is no keyboard or mouse. 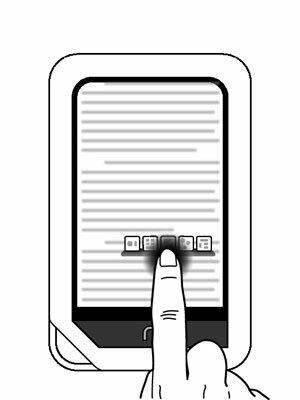 Instead, you communicate with your NOOK Tablet using some simple hand gestures. Not every page on the NOOK Tablet offers the same set of features, but you’ll quickly learn how to tap-dance your way anywhere you want to go. A tap is a quick strike by the tip of your finger. Think of poking at a key on a computer keyboard. A double tap is two pokes by the tip of your finger in quick succession. Double-tapping the Home screen cleans things up and arranges book and periodical covers in a grid. If you’re at the Home screen, Daily Shelf, or Library, double-tapping a book cover displays details about the item. You get the same result double-tapping a book cover in the B&N online bookstore. On the web or in the picture gallery, double-tapping an image zooms you in. The same happens when you’re reading a PDF file, including some books that are stored in that format. Double-tapping an enlarged image or page from a PDF will return the image or page to its original size. To press and hold, touch a finger to the screen and hold it there for 2 seconds. Then lift your finger off the screen. On some other tablets and smartphones, the press-and-hold gesture is called a long press. Depending on what’s onscreen, a press-and-hold usually opens a menu. Press and hold a book cover and then release to show a menu with options such as Open the Book, Recommend It, or Lend It. Press and hold on an item on the Daily Shelf to get the opportunity to remove the book from display. Press and hold, then lift, from a word in a book to open the Text Selection Toolbar. This particular menu lets you look up a word in the NOOK Tablet’s dictionary, or go online to read more about a word, name, or phrase. The same toolbar allows you to add a note to the beginning or end of a passage in a document, or to bookmark that page. A press-and-hold on the cover of a book or periodical in the Library allows you to send that publication to your personal archive. (It’s not deleted, but you can’t see it in your listing of current reading material.) Or you can delete a file using the same menu. When you’re typing, press and hold a letter on the virtual keyboard to display accents, diacritical marks, and special characters. To open a file stored on a microSD/microSDHC memory card, go to the Library, tap the my Files icon, and press and hold a filename. A press-and-hold on the Home screen’s wallpaper lets you choose a different background image: one of your own pictures, a supplied image, or an animated scene you can buy from the B&N app store. In the music player, a press-and-hold allows you to add a track to a playlist.